An obvious goal for any employer, smarter hiring does not necessarily mean faster or cheaper hiring (although neither of those hurt.) Instead, it means hiring the best people-the ones who will provide maximum benefit to the organization in the long term. To attract the right people, sharp employers are creating a balanced application process that combines the streamlined accessibility of an applicant tracking system with the nuanced assessment style of human-resource-driven recruiting. The logic being that if applying to a company is easy and inviting, it encourages desirable candidates (i.e., people who are selective in their job search and unwilling to waste precious time on cumbersome online applications) to take the first step toward working for that company. 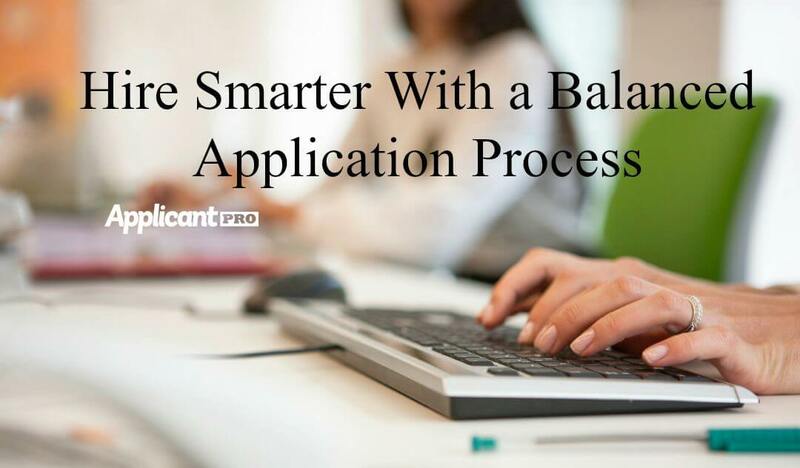 What does a balanced application process look like? While there isn’t one particular company or organization setting the industry standard (yet), an ideal system is one that engages talented candidates. Meaning that people are converted from merely perusing a company’s job postings to actually completing and submitting an application. The software itself should acknowledge all applicants, and the screening process should be such that hiring managers reach out directly to talented candidates-both the ones best suited for the available position and those who might be eligible for potential openings in the future. By interacting with skilled workers who are not necessarily right for the current opening but are suitable for other areas of the company, employers can develop a talent pool that will be a valuable resource in the future. Overall, a “user-friendly” application process should be just that: agreeable to the needs of the user (i.e., job seeker) by, first and foremost, accommodating the limited time they have to spend filling out online applications. Developing a condensed initial application is critical, as is letting job seekers know about the application’s brevity in the job posting. Companies that see the best results are those that state within their job ads how much they value potential applicants’ time and therefore only initially require a cover letter, resume, and answers to a brief (but specific) questionnaire (which should take no longer than ten minutes to complete). The bottom line is that, after a long recession, the United States is rebuilding its robust economy. While employment is still-and likely always be-a seller’s market, the mentality that job seekers should “take what they can get” is thankfully dissolving. Savvy employers are those that recognize how to hire smarter and stay competitive by attracting top-quality talent. An appealing application process and the right recruiting software can help make that happen.